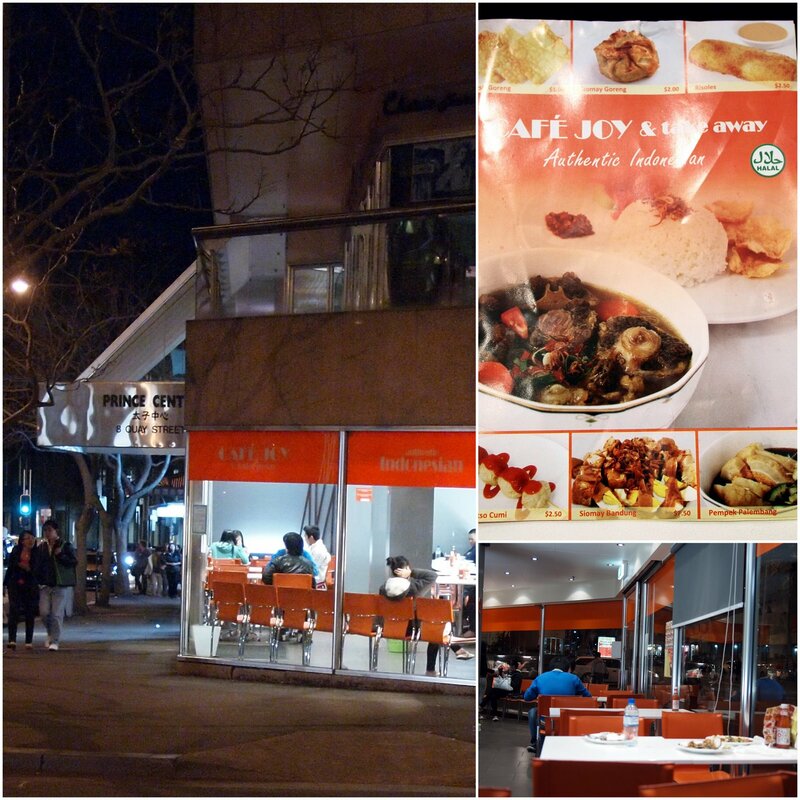 We revisit Cafe Joy for Ramadan specials, which aren't so special, and end up having some fine regular Indonesian street food instead. One sunny afternoon a few years ago we were in Kuantan in Malaysia and stumbled upon an amazing outdoor Malay food fair in a public park. The food was fresh and incredible and we could barely contain our excitement, this place was just one huge nasi campur. A guide from the local tourist office took us under his wing and with great pride taught us all about traditional Malay food and helped us make our purchases. He then left us to enjoy our food then we sat down under a tree to enjoy our feast on this beautiful hot sunny day, did life get any better than this? Halfway through eating DonnaChang and I noticed none of the locals were eating, nobody, not a sausage. They were buying food by the boxload but taking it away. Strange, we thought, and kept on eating and enjoying the sunshine. We noticed some of the locals were giving us funny looks, a few folks even seemed a bit cranky with us. Then, looking up, we saw a huge banner announcing... Ramadan Festival. Here we were chomping and slurping away like a pair of stupid smiling infidels while the locals starved until sundown at the holiest time of the year. Right next to a mosque. Idiots. A social faux paus yes, but dang that food was fine. And the locals later assured us the Allah would forgive us. If only we had visited Kenny Roger's Roasters who had signs advising official sundown times, that Kenny is the cleric of the county. On a side note we did try some Kenny Roger's Roasters for a laugh, we were disappointed to find it was actually quite good. Back in present day Sydney it's Ramadan and we are thinking of all those patiently waiting to break their fast. 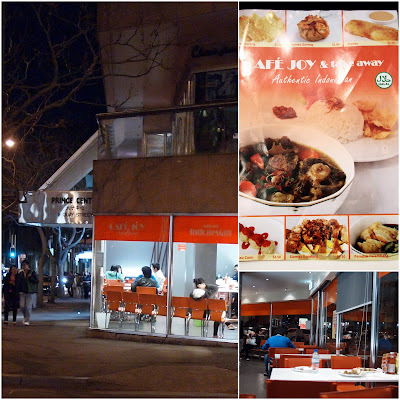 We make a special trip in to Chinatown to try the Ramadan specials at Cafe Joy, but the specials are regular menu items and at pretty much the same prices as going a la carte, which is exactly what we do. Nasi Tim Ayam - Indonesian steamed rice with chicken and mushrooms - $8. Chicken and mushroom morsels, much like those we have had in bakmi, atop of steamed rice flavoured with chicken stock. The rice tastes like something nanna would make. Simple and homely. Pempek Palembang - Traditional Indonesian Fish Cake - $7.50. Fried fish cake with a googy egg yolk in the middle, served in a pond of delicious sauce made from sweet kecap manis and we guess a little vinegar, and a few glass noodles, and a cucumber to give it hit of freshness. The fish cake was a nice snack but we really loved the sauce which we dunked everything. Lontong Cap Go Me - Indonesian chicken curry served with sticky rice, tofu and egg - $8.50. Like a curry laksa, lots of turmeric, yum, plus some squares of fried tofu, chunks of rice cake and a boiled googy egg. Martabak Bangka Cokelat Kacang Keju - $6.50. A fancy pants chocolate martabak, or motorbike as Miss Melba calls it, a thick pancake with Dutch chocolate sprinkles, nuts and cheese. Yes, cheese. It's a bit sweet and savoury and doesn't quite gel with our western palates. The cheaper, plain chocolate version may work better for us, $4, we'll try it next time. Calpico Soda - Melon Flavour - $2.50. I luurrrrvvveee this stuff: Calpico is soft drink with yoghurt, sounds bad, tastes wonderful. Super sweet. Calpico is originally from Japan and has spread all over Asia, it's the Hello Kitty of refreshing beverages. Ayam Bakar - Grilled marinated chicken served with chilli and sweet soy sauce, served with rice - $8.50. This is another one of those dishes we saw a lot in Java but never got around to trying. It's an instant new favourite: the chicken is wonderful but beware of the sambal, it is fiery hot. 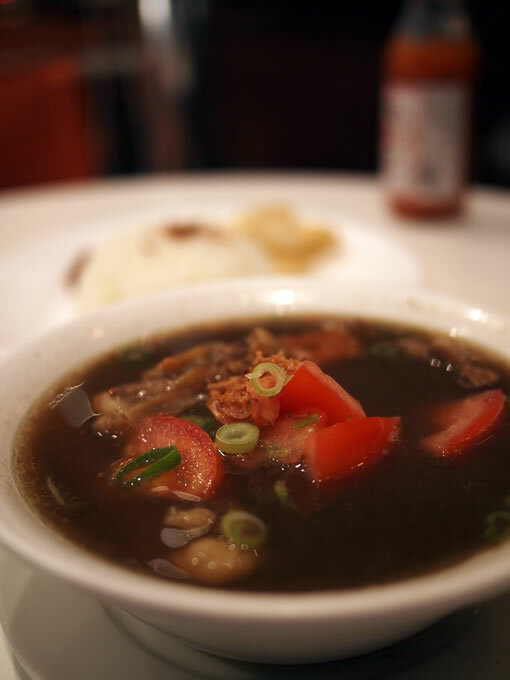 My god the chicken is good..
Sop Buntut - Indonesian oxtail soup (served with rice) - $9.50. Nice rich, thin beefy stock, with a few pieces of pieces of ox tail and steamed rice served on the side with prawn chips and super hot sambal. Kewtiau Kuah - $9.50. Thick flat kway teow noodles in a mild beefy broth, with shreds and chunks of beef. Not a mind blower but pretty dang good, who doesn't like kway teow? Veggie nasi campur - $8.80. Three veggie picks from the lunchtime bainmarie-of-love: boiled egg in spicy sambal; green beans and tofu and a veg/mystery meat dish. Cafe Joy Menu - Click to Enlarge. Cafe Joy is at shop 17/18, 8 Quay Street, Prince Centre, Haymarket - corner of Quay and Thomas Streets. Open seven days, 10.30am to 9pm. Cafe Joy has such a fitting name, it's such a bright and cheery little place and the staff are always lovely. It's a bit out of the way on the outskirts of Chinatown and probably isn't as popular as it should be, they have been churning out Indonesian street food classics at student prices for years. It's one of the few places were we want to try every single dish on the menu.